In ancient philosophical traditions, Alchemy was considered a powerful practise which gave practitioners the ability to transform base metals into gold. Wouldn’t it be nice if each of us found an Alchemist too, in our lives? Someone who could work with our ordinary selves, with all our biases, limitations, warts and all – and transform us into powerful individuals, who believe – as in the tagline of Adidas that: Impossible is Nothing! Most people are weighed down by the limitations they put around themselves. And what is true for individuals are true for teams & humanity in large too. Medical studies said that a human can never run a mile in under 4 minutes. It took one Roger Bannister to break that record & belief, before many other athletes did the same, soon after. Bringing together a set of 5 transformational activities – Fire Walking, Rod Bending, Board Breaking, Arrow Snapping and Glass Walking, Youphoria Outbound & Adventure through The Alchemist Challenge, invites you to a one of a kind workshop – which will not just help you break your own limiting behaviors, but also help you challenge your deepest fears and build your confidence in a whole new way. The Alchemist Challenge! is a wonderful example of mind-body connection. 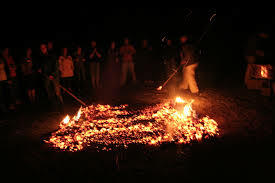 For those who care to dig deeper for instance, fire walking is explainable in terms of basic physics and is not supernatural nor paranormal… One popular theory is The Leidenfrost Principle. According to this, a layer of moisture between a source of heat and human skin will evaporate into vapour on contact and will temporarily protect the skin from burning. This is as long as one walks briskly along the burning ember. However, should your faith be weak – making you dilly-dally, the fire will burn you for sure! Similarly, each one of the activities that make up The Alchemist Challenge – challenge your deepest held beliefs. And as you overcome each of them, the realization sets in that what really holds you back as individuals & teams is your own self-limiting beliefs! Think about it – how much more powerfully could you live every single day of your life, if you truly believed you had no limitations? What could your team achieve if they thought on similar lines? 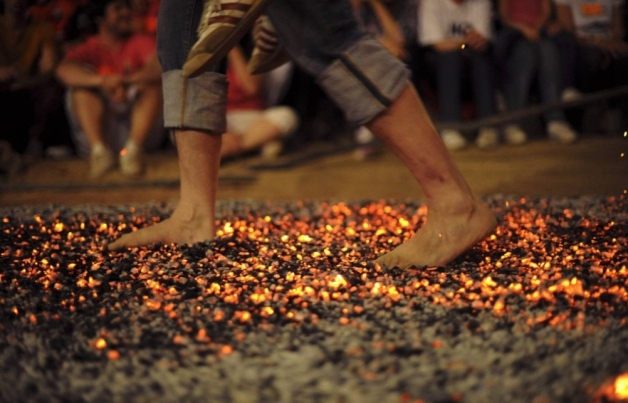 Fire walking when run professionally by a qualified facilitator is a limited risk activity. In the last decade for instance, about 2 million people across the world walked on fire in different programs conducted by qualified Facilitators. The approximate number of burns reported was around 50-60. These numbers included mostly minor foot blisters (these are of the same kind that you get while walking with a new shoe). To put it in perspective, the chances of an injury in a crowded Indian public transport vehicle are likely to be higher! Having said that, at Youphoria Outbound & Adventure – we are paranoid about safety. All YOUPHORIA OUTBOUND & ADVENTURE Facilitators are certified in administering First Aid. Further, The Alchemist Challenge! is only conducted after all necessary safety precautions are in place: like Water stations, First aid kits, Fire extinguishers and a doctor on call. Would The Alchemist Challenge! be right for my team? For any team that thinks that it could benefit from overcoming its own self-limiting beliefs and behaviors, The Alchemist Challenge will be a transformational experience.